Ghairtí an teideal seo (An) Caoch de thiarnaí Gaelacha na barúntachta seo ina dhiaidh. Féach leis tagairt stairiúla faoin bparóiste Inis Caoin, an chuid sin den bharúntacht ar ar tugtaí Clann Chaoich an Fheadha (nó Clann Chaoich Uachtarach nó Clann Chaoich na Seanchlainne) tráth. This title was borne by subsequent Irish rulers of this barony. 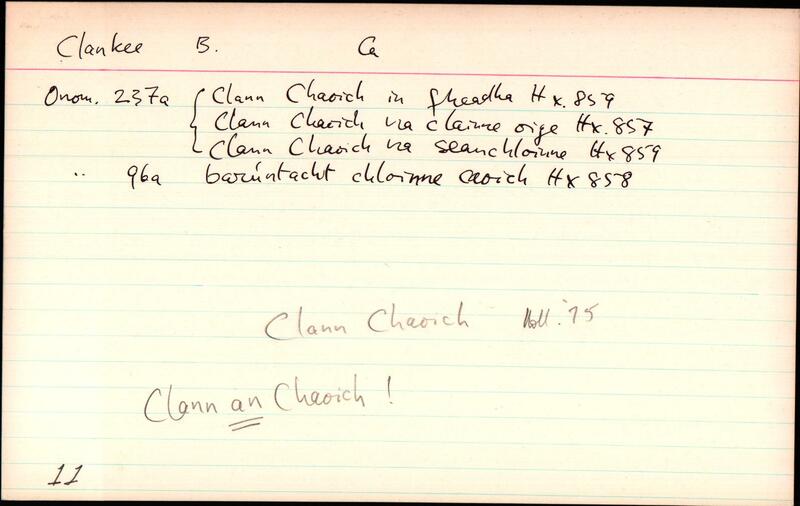 See also the historical references under the name of the parish Inis Caoin/Enniskeen, which part of the barony was once called Clann Chaoich an Fheadha “Clann Chaoich of the wood” (or Clann Chaoich Uachtarach “Upper Clann Chaoich”, or Clann Chaoich na Seanchlainne “Clann Chaoich of the old family”). · Celtica, Volume 1, 76 "cap. Cillín Céir. Comitatus Cavan." nóta eag. : "A cCloinn Chaoich added but crossed out." · LSO (Ca), 131, Author TÓC "I could as yet learn nothing about the name Clonkee."